If you visit Taco Bell this might be a nice coupon for you. 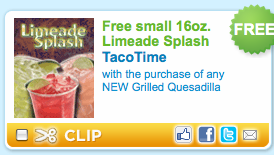 Get a free Limeade Splash when you purchase a New Grilled Quesadilla. Click Here to print (choose restaurants on the left hand side). If you cannot locate it with your zip code use 99208.